Agni Service & Security Pvt. Ltd.
We deal in Dog Patrolling Services and we provide these to our clients. We provide dog patrol services to maximize the protection of our clients businesses and our service are available at market leading price. Our dog squad comprises highly pedigreed and trained german shepherds, doberman and labradors along with skilled and experienced handlers. These squads are effectively used in industrial applications for perimeter and facility patrol, high security installation zones, building/area search operations and intruder detection / apprehension. Our dog squad comprises highly trained German Shepherds, Doberman and Labradors along with skilled and experienced handlers. Beat vehicle having the Subhahu installed smartphone moves through the added fence, locations will be updated automatically in the server. FIRST CHOICE FACILITY SERVICES has been providing quality dog services by a qualified veterinary doctor who has a clinic in chennai. We have over 300 dogs including: German shepherds, Rottweiler and Dobermans amongst others. We provide Dog Squad services with the help of our team of dog trainers and experienced personnel. These services are considered to be the most trustworthy form of protection as the dogs have amazing sense of hearing and smelling. We provide ‘Specialist’ Detection search dogs to cater to your specific needs and requirements for full proof security and safety of you and your workplace. We are one of the leading service providers of Dog Squad Services. The offered dog squad service is carried out for investigating the crime scenes. Our offered dog squad service is available at both the urban and rural areas. The offered dog squad service is executed by highly trained, dogs. Our offered dog squad service is very affordable in rates. We specialize in supplying highly trained dog teams for any site or location. 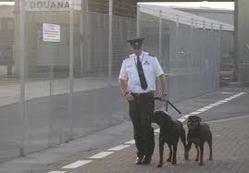 Both fully trained by Experts , each with their own fully equipped specialist guard dog transportation vehicles are available for those assignments that require the additional security and deterrent of a fully trained guard dog. Vigilante has a top breed dog squad consisting mainly of German Shepherds, Labradors etc. These are expert sniffers as well as guard dogs used for a host of protection related purpose.